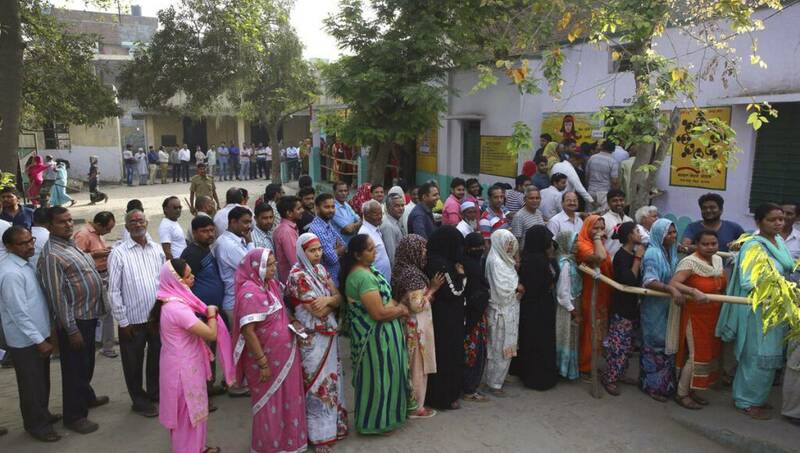 Photo: Indians stand in queues to cast their votes at a polling booth for the first phase of general elections, near Ghaziabad Thursday, April 11, 2019. New Delhi, Apr 11 : Polls opened Thursday in the first phase of India’s general elections, seen as a referendum on Prime Minister Narendra Modi and his Bharatiya Janata Party. Voters in 18 Indian states and two Union Territories are casting ballots on Thursday, the first day of a seven-phase election staggered over six weeks in the country of 1.3 billion people. A polling officer puts indelible ink mark on the index finger of a voter for the first phase of general elections, near Ghaziabad, India Thursday, April 11, 2019. Some 900 million people are eligible to cast ballots at around a million polling stations across India. They will decide 543 seats in India’s lower house of Parliament. An Indian Muslim woman casts her vote at a polling station in village Sawaal near Meerut, Uttar Pradesh, India, Thursday, April 11, 2019. An Indian paramilitary soldier stands guard as a young boy dressed as a policeman stands next to his mother in a queue to cast their votes in village Sawaal near Meerut, Uttar Pradesh, India, Thursday, April 11, 2019.